home » volunteer-surveys » gbw » about » background » projects » berries » about-berries » Berries - what's in a name? Berries - what's in a name? A berry is what a botanist would call a ‘true’ succulent fruit, with one or more seeds enclosed within a single structure. Each seed – which lacks any stony protective coat – is held within pulpy flesh formed from the wall of the ovary. The fruits of currants and nightshades are berries. The fruits of some other plants, such as Blackthorn, resemble berries but are, strictly speaking, drupes, the difference being that the seed is encased in a stony or woody coat. 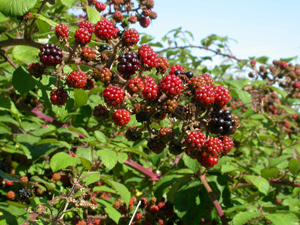 The fruits of blackberries and raspberries are compound drupes, the fruit composed of many smaller drupelets, each of which contains a seed. Other drupes include sloes, plums and cherries. False succulent fruits are those in which the fleshy case around the seed is formed not from the ovary wall but from other parts of the flower. The best example of a false succulent fruit is a rose-hip. The fruits of hawthorn, cotoneaster and whitebeam develop in a similar way to a rose-hip but are more berry-like in appearance. They are called a pome by botanists, a term that also applies to the fruits of apples and pears.